Thank you for your interest in Boots On Stage! Tickets will be available at the door for $15. IT'S OUR 1-YEAR ANNIVERSARY SHOWCASE! 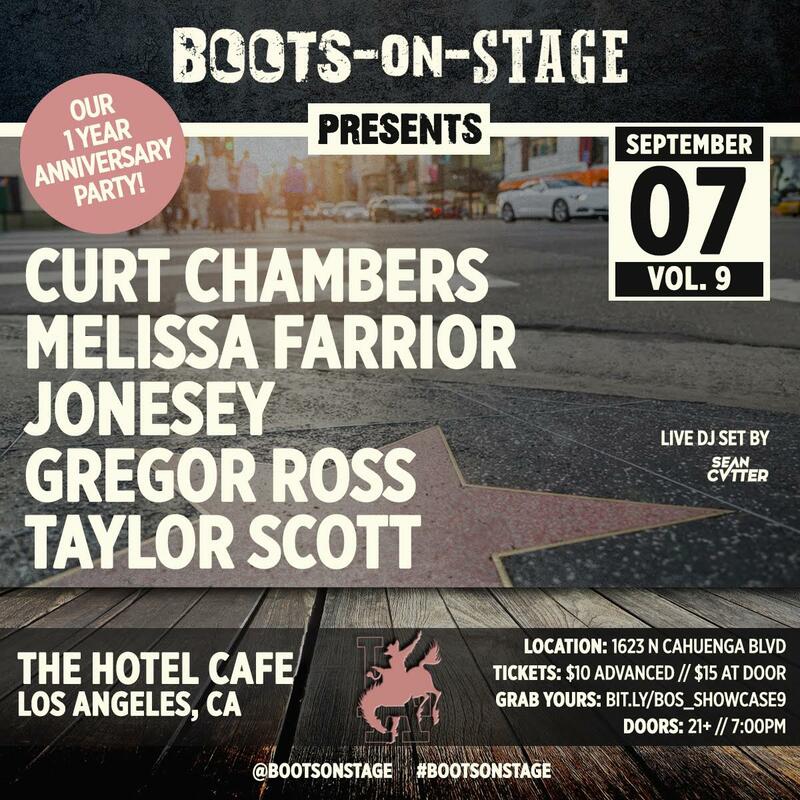 Boots On Stage presents monthly showcases of country music artists the first Thursday of every month of the historic Hotel Cafe in Hollywood, CA! 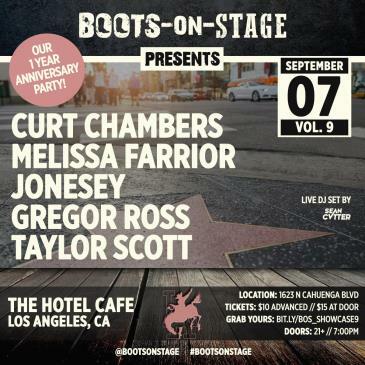 On Thursday, September 7th, for it's One Year Anniversary, Boots On Stage Presents: Curt Chambers, Melissa Farrior, Jonesey, Gregor Ross and Taylor Scott! In addition to the performances, we'll have our resident DJ, Sean Cvtter, spinning today's country hits and your favorite old school hip-hop. Tickets are available in advance for $10 here an also at the door (subject to availability) for $15. 21+ show. Looking forward to seeing you for some country music and as always, thank you for your continued support for Boots On Stage! Curt Chambers is an American singer, song writer, producer and recording artist who has gained notoriety for his unique fusions of rock, soul, country and hip hop. 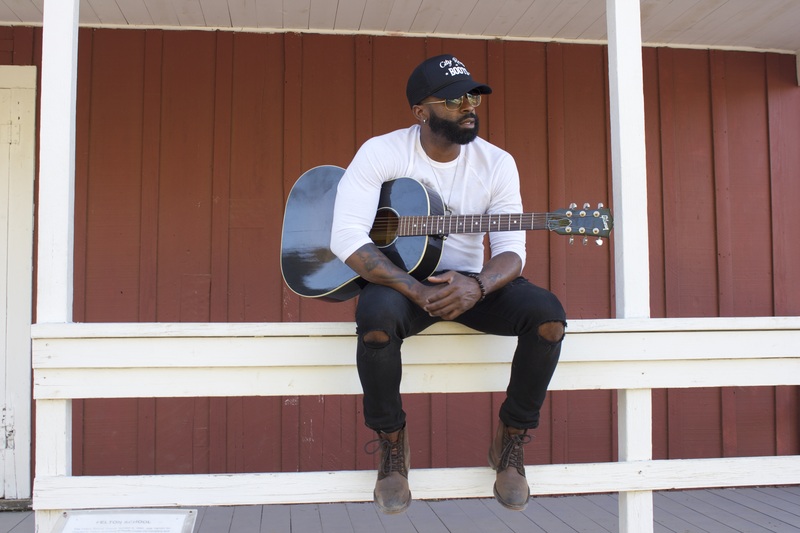 Often described as refreshing and innovative, the Philadelphia native’s gifts as a musician were cultivated at home and in church where he was raised to appreciate multiple musical genres and was influenced heavily by gospel, soul, blues and country. He was taught to play several instruments including, piano, drums and guitar. It is on the guitar, however, where the essence of Curt Chambers comes to life, captivating all who are fortunate enough to witness. Curt’s immense talent partnered with his wildly diverse blues, country and hip hop power packed performances humbly provided him the opportunity to share stages with a wide array of musical legends such as BB King, and Jerry Douglas as well as rock and hip hop icons Travis Barker, P. Diddy, Eminem, the legendary LL Cool J and many more. With a sound that is unique, multi dimensional and holds no boundaries, Curt Chambers nurtures his love for musical pluralism as he collaborates with the industry's best pop and country artists building a legacy that continues to cross genres and creates cutting edge musical masterpieces. 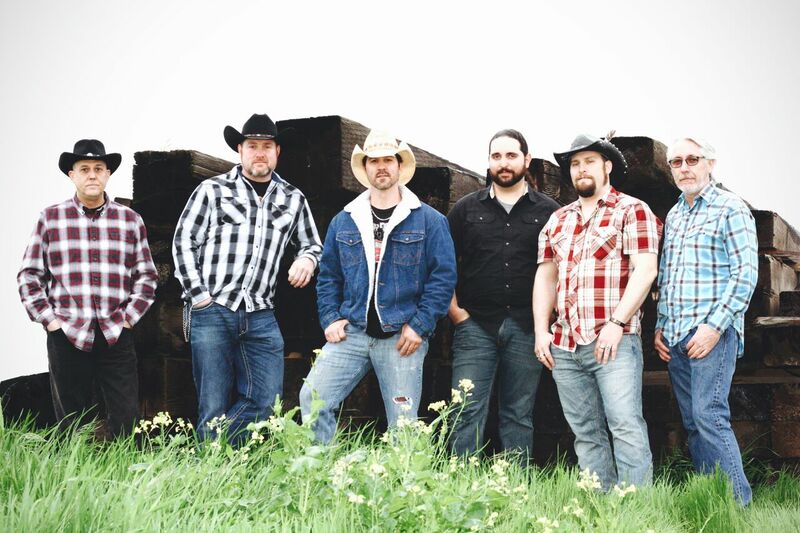 Melissa Farrior Band is an exciting five-piece “Modern Country” band delivering high energy performances with your favorite Country Covers and Originals. Melissa Farrior Band has grown to be a favorite Today's Country Band out of Southern California. Paul and Christina Jones were born and raised in Los Angeles by parents who are both doctors, but they somehow inherited the hidden, musical genes in the family. They both discovered at young ages that they had a passion and gift for music, when Paul taught himself how to play the bass guitar at age twelve, and Christina began singing in musical theatre at age ten. Their obsession with music continued throughout high school and college as Paul majored in Jazz Bass at the University of California Irvine, and Christina studied Poetry at the University of Southern California to refine her skills in songwriting. Upon graduation, the siblings formed a musical group known as "Jonesey" and began playing shows throughout Los Angeles and Orange County. Paul brings the musical taste and sophistication, while Christina brings the quick-witted and emotive lyrics to this hit-making Pop-Country duo. Together, these two are the ultimate entertainers who bring the stage to life with humor, magnetic personalities, and explosive talent. Follow these two as they break out and carve a name for themselves into the Country Music scene. Just about a hundred miles from the middle of the state, sits Caruthers California. Caruthers is famous for the Caruthers District Fair, the famous bi-plane in the filling station, and soon, the home of country music's latest find - Gregor Ross. Now, Caruthers is nowhere near the country music capital of Nashville, but it is a fairly good hop-skip-and a-jump to Bakersfield, which enjoys a country music lineage of its own. Gregor's musical lineage runs deep. His grandparents were both singers and instrumentalists with Bob Wills and the Texas Playboys, and they instilled the love of country music in Gregor. After years of watching the Grand Ole Opry with his grandfather, Ellis would opine that Gregor would get to play there one day. "Ours is a big ol' rambunctious family," Gregor smiles. "They all recognized that I loved music, but no one ever really thought I would go down that road because I had 80% hearing loss in both ears”. "We all worked hard, and as a teenager I felt I had to jump in and pull my weight." Gregor's uncle Rick taught him the skill of welding - to great success. Gregor is a Champion Welder having won skills competitions across the state. This is an art that is definitely not on the usual resume of a country artist. He's been a professional welder since he was a teenager, but during every break he always returned to his guitar. play music in earnest. "Music to me is like a photo album full of memories," Gregor explains. Of course, like all young men, he dabbled in rock, but it was country music that remained in his heart. Every chance he could, Gregor would play and sing locally, expanding his realm to include Bakersfield and Buck Owens' Crystal Palace. approach to "Lyrical Mixing" has charted at #1 on iTunes, on the Billboard charts and gained him a featured position as a master educator on Pro Studio Live. Gregor and the band were recently a top ten finalist for the 2016 NashNext competition in Nashville hosted by Big Machine Label Group. 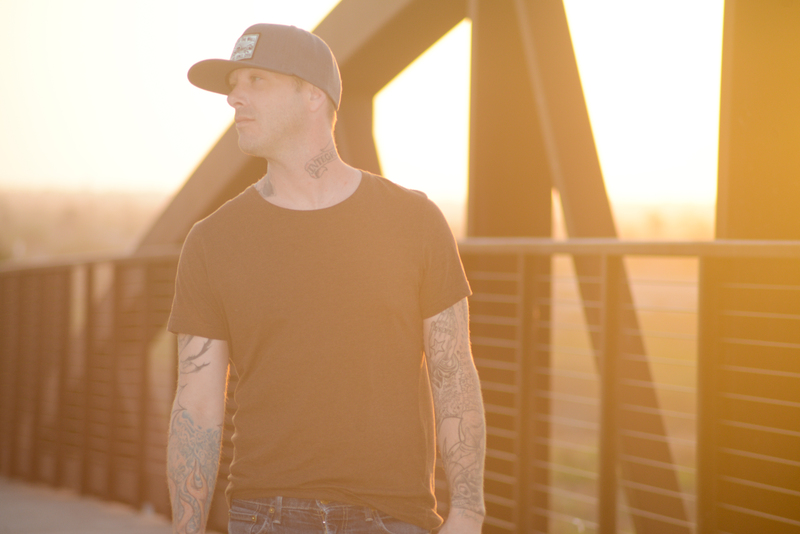 Singer Songwriter “Taylor Scott” crafted his writing and sound while ​playing and recording in the Orange County music scene. Born in Oakland Ca. and growing up in Napa Valley, Taylor moved to Southern California to further pursue his music career. Since relocating, he has played and toured with top national acts worldwide and its over these years, Taylor has built a true rapport in the music Industry. His Management throughout the years stems from John Maurer to Nettwerk Management, has worked with top notch producers Lucas Pimentel , Steve Baughman and Cameron Webb and also many amazing musicians and songwriters throughout the years. Taylor has just released his 4th single "That Look in her Eye" and video to accompany the single .Taylor will be heading across the country in April 2017 on his first Midwest leg of spring and summer touring with dates in, NM ,TX , Memphis TN , Nashville TN (Nashville Film Festival) City Winery, SC, NC (Charlotte Music Festival) and more dates will be announced soon! Make sure to catch Taylor in one of these city's near you.